We've already covered the basic dilemma with the AMD platform right now: to PCIe or not to PCIe, that is the question. You hopefully know yourself well enough to have made a decision on whether you want to be an early adopter or if you want to trail behind the bleeding edge and take a conservative approach. Our recommendations, incidentally, are made in light of what is actually available right now. We look at several vendor sites as well as our own RealTime Pricing Engine to find out what is currently in stock. That means there are exactly three PCIe boards from which to choose, and two of them are really in the high-end performance market (the SLI boards). On the conservative approach, we continue to stick with the AGP platform and the nForce3 250 Ultra chipset. The MSI K8N Neo2 Platinum [RTPE: MSI K8N Neo2 Platinum] has worked very well in our testing, and we have several systems using it that are running without any problems. Tweaking and overclocking options are very good if it's something that you're interested in, and you get known reliability and performance with a low chance of any unforeseen bugs in your system. If living on the bleeding edge and potentially troubleshooting your new PC on a regular basis is not your idea of a good time, this is still the most sensible platform. Realistically, this will probably be the last time that we actually recommend this platform, as the new nForce4 motherboards - not to mention alternatives using the ATI Express 200 chipsets and perhaps even some VIA PCIe solutions - should reach the point where we can give them a full recommendation by the time we next run our Mid-Range Guide. For the processor, we opt for the 90nm Athlon 64 3200+ part [RTPE: ADA3200DIK4B]. It offers plenty of power with a reasonable price. Overclockers will also appreciate the added clockspeed headroom and reduced heat of the 90nm parts, but that's a topic for another Guide. A 3500+ would be nice, but the 90nm parts are too expensive while the 130nm 3500+ has a higher power draw. Our tests showed that the power draw of the 90nm parts is significantly lower than the 130nm parts. So, if you're the one actually paying the electricity bills, the 90nm parts will easily save you money over time, relative to the 130nm parts - particularly if you leave your PC running 24/7. For those who like to live on the edge, PCI Express boards are finally starting to appear at retail. Finding them in stock, unfortunately, can be difficult, and this affects our recommendation. You'll have to wait for a full review, but our "mid-range" suggestion right now is to pick up the Gigabyte GA-K8NF-9. Newegg has listed the Chaintech VNF4/Ultra [RTPE: Chaintech nForce4 Ultra VNF4] for a couple weeks now, but either they're disappearing so fast that they're almost never in stock, or they may not really be available yet. The Chaintech looks to be the potentially better performer, as it includes the Ultra version of the nForce4 chipset instead of the cheaper 4X version. The difference, if you recall, is that the Ultra has an unlocked HyperTransport multiplier that should offer more in the way of overclocking, while the 4X is supposed to be locked at a 4X HyperTransport multiplier (800 MHz) - at least, it's not validated to run at anything other than 4X. If you're not concerned with official validation, the Gigabyte GA-K8NF-9 [RTPE: Gigabyte nForce4 GA-K8NF-9] is readily available from several sources, and it includes some additional features like IEEE1394b. If you're really serious about shifting to PCI Express boards right now, a better pick would probably be the ASUS A8N SLI Deluxe [RTPE: ASUS nForce4 A8N-SLI Deluxe], which is available for about $200 now from several locations. Gigabyte and MSI also offer SLI boards, but they're less available and even more expensive than the ASUS. We've talked a lot about the benefits of SLI vs. non-SLI, but let's just say that it's the only option that makes a lot of sense to us at this moment in time. 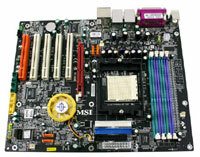 If you really want to make the shift to PCI Express, you might as well get an SLI motherboard at the same time. It's a high-end option, of course, but so are all PCIe graphics cards above the 6600GT. 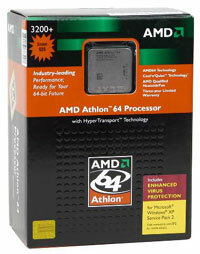 For the processor on our alternative platform, we've upgraded to the Athlon 64 3500+ processor [RTPE: ADA3500DIK4B]. Spending more for the 3800+ will take us well out of the mid-range price segment, as the 3800+ costs nearly twice as much as the 3500+ - even the 3500+ is rather expensive. We use the 90nm 3500+ as opposed to the 130nm version (which is cheaper at present). With the potential SLI video cards sucking down a lot of power, it can't hurt to cut the processor's power consumption.